The will call window opened at 5:30, the lobby was set to open at 6 and the event started at 7pm. We arrived at the Majestic Theatre right around 5:20 and the line was starting to wrap around the building. We jumped in, and ended up being in good shape. We got our tickets and copy of The Ocean at the End of the Lane at 6:00 and since we had VIP tickets, we got to choose any seats in the first five rows. We were in row 2 with only one row and the orchestra pit between us and NEIL! 1,500 people attended. It was in a huge theater so it was impressive to look back and see full balconies for an author's reading. The event was late starting because there were still people in line trying to get in and seated. It began about 7:30. 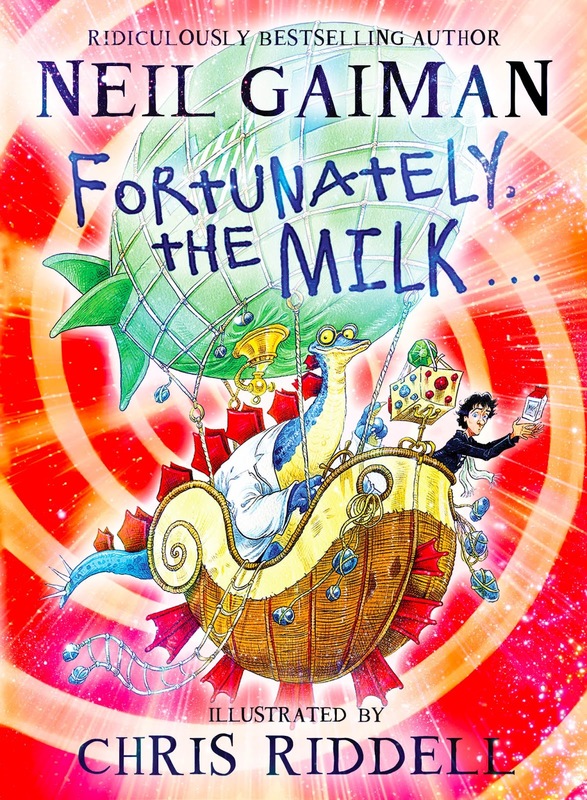 Gaiman gave some background insight into the writing of The Ocean at the End of the Lane and expressed that Dallas is special to him in relation to this book because he finished drafting it in Dallas coffee shops while his wife was mixing her album with a producer here. Before he started reading, he warned us to check and make sure our cell phones were silenced because, "It's Texas and someone might shoot you." He read from one of the opening chapters of Ocean, and it was just lovely and funny and wonderful. Buttery English accent and all. I can't remember all the questions--I have the retention of a peanut--but there were lots of laughs. The last question in Q-and-A was from a 10-year-old girl who asked which of his books is his favorite. He said right now it's The Ocean at the End of the Lane because it's so personal to him. But he said he has a new book coming out in September, and that one will probably be his favorite when it comes out. 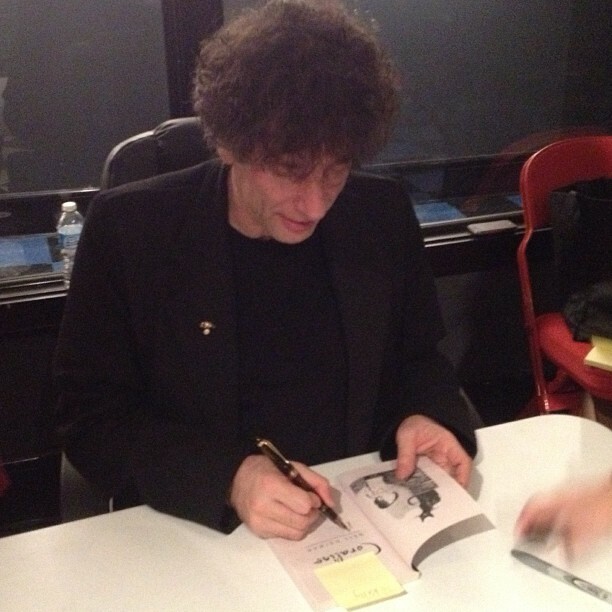 And that was a great segue, because he READ FROM THE UPCOMING BOOK!!! He said he couldn't help himself because since this is his last tour, he wouldn't have the chance to read from it in a setting like this again. 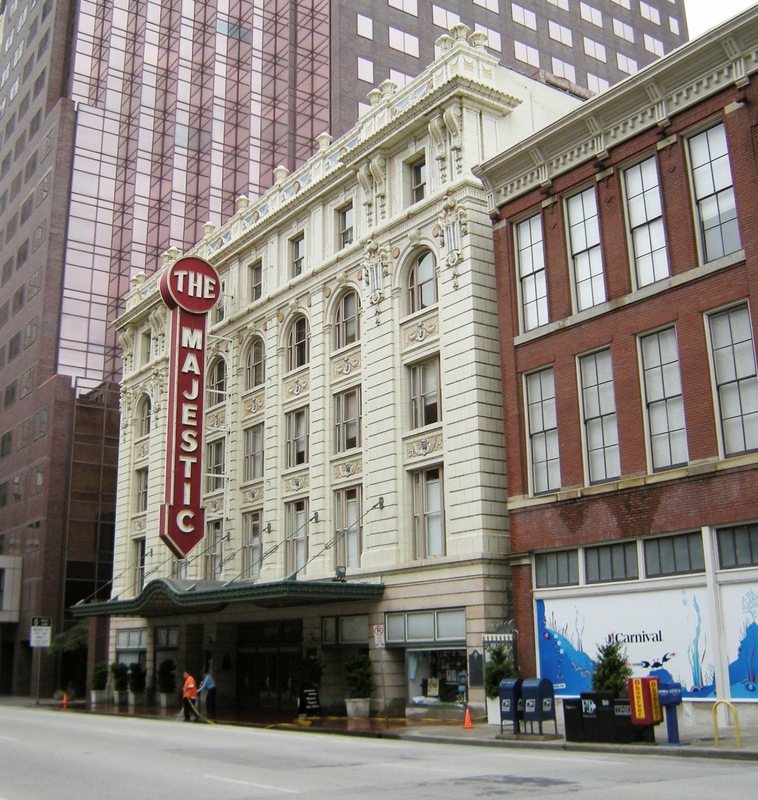 He said the Majestic Theatre was so beautiful it was a perfect setting to read in and he wanted to do the voices. 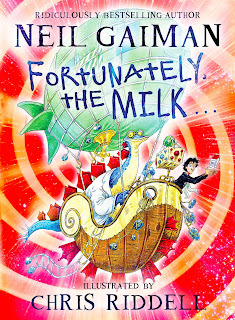 The new book, called Fortunately, the Milk, is about the heroic things dads do. Namely, going out to get milk for their kids' cereal whenever it's necessary. After the father in the book has been delayed, he expounds to his children about how he was abducted by aliens, snatched by pirates, and flew in a hot air balloon with a stegosaurus. But fortunately, he still had the milk. It was AWESOME. His voices are so dang cute. Many many laughs. So after the readings and the Q-and-A ended, they started tagging the books for the signing and giving out wrist bands. We were the second row to go back and get signed. Unfortunately, there were no posed photos because of the sheer amount of people in attendance. I think they assumed more people would leave and not stay for the signing, but they obviously don't know Neil Gaiman fans and Neil's marathon devotion to signing. So we went through the line. David took pics of my approach. I got Ocean inscribed to David and I, and The Graveyard Book was signed. I thanked him for taking the time to sign and told him he was a trooper to sign for so many people. His response,"I'm flattered that so many people have come out." 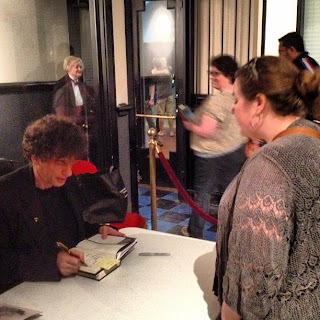 I also thanked him for reading from the new book and he totally stopped what he was doing and glowed! He said, "Oh I just couldn't help myself. I had to do it. 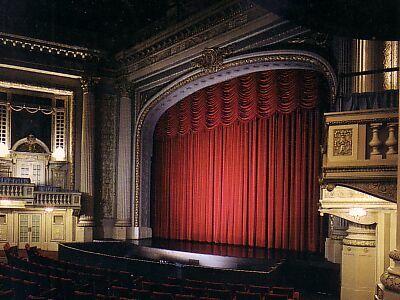 The theater is beautiful and I love doing the voices." 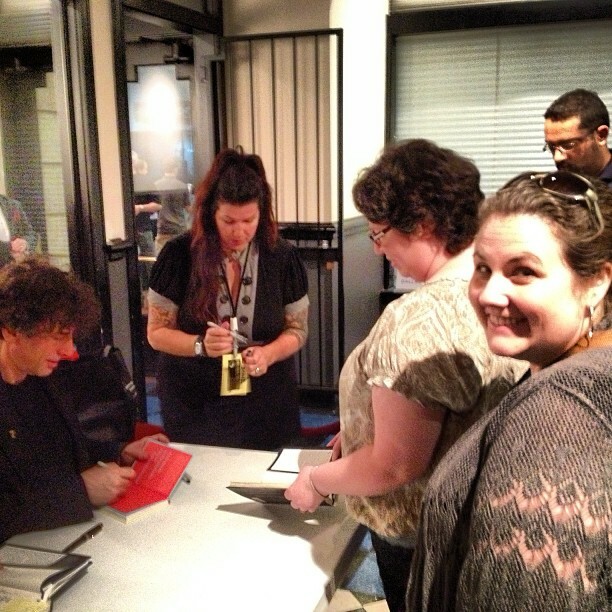 We were done and on our way home by 9:30, but according to his Twitter, the signing ran until 2:23am. He broke David Sedaris's record for a previous year's appearance. So yeah. High as a kite was me! I love him even more in person, and I ADORED The Ocean at the End of the Lane. It's my new fave, hands-down. To learn more about the genesis of this novel, read the story from the Dallas Morning News. 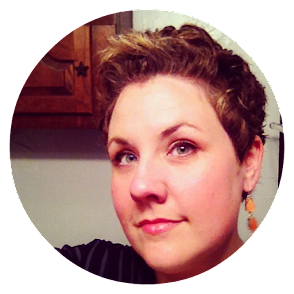 Have you met any authors? How was your experience? This was only my second time! Find my video gushing about this book and meeting Neil Gaiman below!